Shape memory polymers (SMPs) are an emerging class of smart polymers which give scientists the ability to process the material into a permanent state and predefine a second temporary state which can be triggered by different stimuli. The changing chemistries of SMPs allows scientists to tailor important properties such as strength, stiffness, elasticity and expansion rate. Consequently SMPs are being increasingly used and developed for minimally invasive applications where the material can expand and develop post insertion. 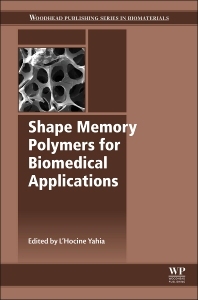 This book will provide readers with a comprehensive review of shape memory polymer technologies. Part 1 will discuss the fundamentals and mechanical aspects of SMPs. Chapters in part 2 will look at the range of technologies and materials available for scientific manipulation whilst the final set of chapters will review applications.